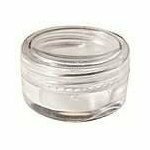 50 pack 5 gram empty clear plastic jars cosmetic jar containers pots. 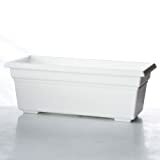 Material: Polystyrene Diameter: 1 1/4" inch X Height: 3/4 inch. Jars for sampling of eyeshadows creams, lip balm lotions and cosmetics. Perfect for sampling mineralized eyeshadows, storing mineralized makeup, and easy to travel with.